I love koi ponds and koi don't you? I remember we used to go to this outdoor restaurant when I was little that had a koi pond. The owner of the restaurant always gave me fish food, and while my parents were eating, and I was bored out of my mind I went and fed the koi. Like most kids I loved all animals, so watching the fish was always fun and peaceful for me. Those were some good memories. I love when I can attach good memories to nail polish, and that's what Rainbow Honey's Koi Pond did for me. 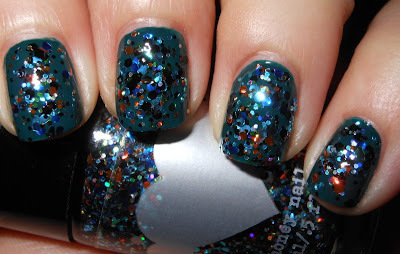 Koi Pond is a dense mixture of varying sized black, orange, blue, green, silver, and aqua glitter in a clear base. This is a great glitter. I absolutely love the idea behind it. The colors match perfectly to a koi pond. I love when indie polish makers take a concept, deconstruct it, and turn it into not only an amazing polish, but one that totally represents their idea. That is some creativity there. This glitter applies great. This was only one coat. Yes, one coat! That's a strong glitter there, and on top of that it was easy to apply. I definitely recommend this one for the glitter fans out there. I also recommend Rainbow Honey! I've loved all the polishes I've purchased from her. That's only one coat? That's insane! That is a great glitter polish. I'm going to have to check out Rainbow Honey. One coat?! Amazing! Every single Rainbow Honey polish I see looks so awesome. Is that teal base part of the polish or did you layer it over something? Because I really like it! Omg! Thank you! It is layered over NOPI Khloe Had a Little Lam Lam. I had wrote that out in the post initially but when I went back and edited the photo in the post it took some of my text with it. Thank you for pointing that out! Yes that's one of coat of glitter. I was a dingbat, and my post got a litte wonky and deleted part of my text. This is actually layered over Nicole by OPI Khloe Had a Little Lam Lam. :) The glitter is in a clear base. I love this glitter! This was my favorite from this collection. Pretty! I love koi ponds too. This is so pretty! I loved the memory you shared along with the awesome polish!